MAISIES COTTAGE is a quaint original workers cottage from the early 1900s. Small, cosy, clean and pet-friendly and just a short walk to the pristine beach, town centre, shops, cafe's, restaurants & Busselton Jetty. Maisies has irregularities and may not suit guests seeking all modern conveniences of today. We have blended the old traditional character of yesteryear with some modern conveniences and priced the cottage to suit families. Doonahs, pillows, blankets all provided as standard. R/C air conditioning and gas heating in main living area. Room heaters, coffee machine and nespresso pod coffee maker, toaster, kettle, TV, additional TV in Master Bedroom, large refrigerator, outdoor BBQ, washing machine, tumble dryer, iron, complimentary baby hi-chair, port-a-cot and stroller, some complimentary bikes available (outlined below) and pets welcome by arrangement (conditions below). Please Note: Maisie's Cottage has a small kitchen and only a small electric cooking oven appliance (not a big stove). We also provide plenty of cooking appliances including electric cook frypan, sandwich grill press, sandwich toaster, small electric oven and rice cooker and of course the outdoor BBQ. We prefer guests bring their our own supply of sheets, pillow cases & towels however guests are welcome to use our supply of linen at the cottage conditional that upon departure, guests wash & dry all sheets and towels used - using the tumble dryer for fast drying prior to vacating - and return items dry and folded to the storage cupboard. Port-a-cot, baby linen, Hi-chair & Stroller and must be cleaned after use and returned to their stored location before vacating (there are many toys, puzzles & early books and much of the furniture is child-safe with limited sharp corners. Please note we are NOT fully-fenced from front to rear so the cottage may not suit all families. * Plenty of books, games and toys, some fishing rods and some personal bikes - 2 x adult bikes and 1 x girls bike age 6/7 - available for use at your own risk. The garden has a pleasant outlook to relax and enjoy the morning on the front verandah, or bbq area on the back verandah. Pets are welcome at Maisie's Cottage but must be well-behaved and are NOT allowed on lounge or bedding. PLEASE NOTE: We are only 3-parts fenced - the area from the front to the back of the house is NOT FENCED so this may not suit some owners (If you pet is well behaved and stays by you at all times you may not have any problems, as many people bring their pets to Maisie's, but if they may wander off, or runs across roads etc., then Maisie's will not be suitable. If you do decide to book and bring your pet you will need to bring: All food/water bowls, bedding, leads, toys. Upon departure please vacuum floors and mats thoroughly and bury all doggy doo. Very sorry we DO NOT accept SCHOOL LEAVER Bookings in November. PLEASE DO NOT ASK. 30 Mins drive to Margaret River and along the way passing many wineries, restaurants and all the wonders of the Southwest of WA. Please note it is cold in Busselton in Winter. The cottage has reverse-cycle wall mounted air conditioning unit in the main open plan living/kitchen area and a gas fire. The two main large bedrooms each have an oil column heater in each room. There is no bath, just a standard walk-in shower. As the cottage has wooden floorboards, make sure you bring warm slippers or socks for the brisk mornings. We do ask that the old traditional fireplaces and wood oven are not used as they pose a fire risk. We named the Cottage after Maisie, the original owner who raised her 4 children here for over 50 years. It reminds us of our past and is still a work in progress for us at every opportunity. BOND: Fully refundable bond required for ALL bookings to ensure Maisie's Cottage is left clean & respectable, similar to how it was presented at your arrival. ... Have stayed a Maisie's Cottage 3 times with our dog. Its great to have such a nice place to stay where you can bring your pet. Perfect for families with babies and children of all ages. ... We all enjoyed our 3 day stay at Maisie's cottage (3 adults /3 children)found the accommodation cosy and comfortable, outdoor bbq area was great and lots of room for kids to play, easy access to town and short walk to beach and in a nice area! ... A wonderful place for my daughter and I to have a 'girls weekend'. We didn’t put the TV on at all and were delighted with all the little knickknacks in the rooms. I've started recommending it to my friends in Geraldton and no doubt we'll be back. ... We loved our stay at Maisie's Cottage. It was clean, cosy and was everything we hoped for our holiday. It had everything we needed which made our holiday even more relaxing. We especially loved sitting out on the back deck in the afternoon sun! It was a perfect place for a family holiday. We will be back next year! ... "Maisie’s Cottage" - what a lucky find for us! 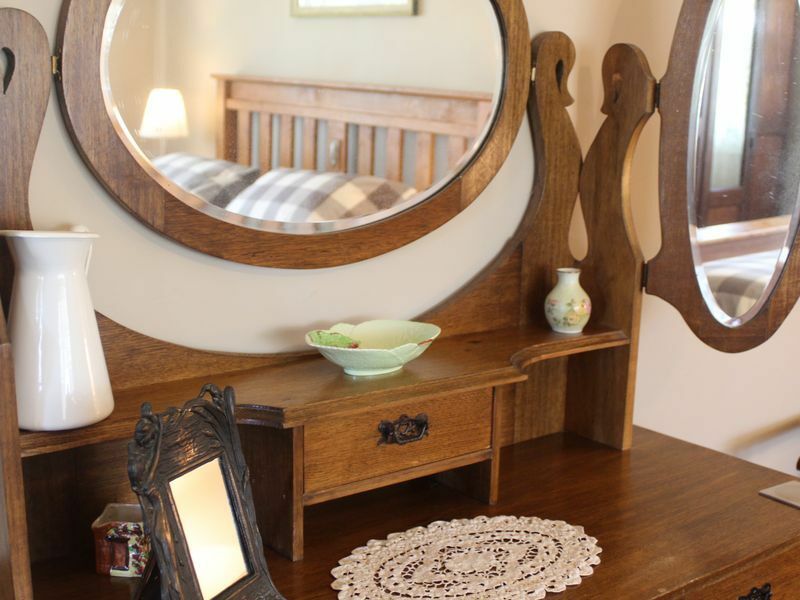 A beautifully restored cottage with accommodation that has everything you need for a comfortable stay. Neat, clean, close to town and the beach. Great base to explore the region from. Will definitely repeat our visit here again later on. ... Thanks for a great place to stay right in the heart of everything we really enjoyed are stay here we will hopefully return 2016. ... Thank you for your perfect family accommodation for our recent visit to Busselton. The amenities and atmosphere of your property were just what we were looking for, and the location to the town sites was great. ... The house was perfect for us - close to the beach & shops and had everything we needed, and very 14-month-old friendly. We were particularly impressed with the welcoming feeling we got from being able to share toys, books, bqq and other things. Less than 5 min walk to beach and "on the beach side" of Bussell Hwy. Maybe 15 mins walk to Busselton Jetty. We prefer guests bring their own linen, however guests may use the linen supply at the cottage provided they wash, tumble dry, fold and return the dry, clean linen back to the original store cupboard. We do NOT have fixed internet connection at Maisies, but the cottage is in an excellent WIFI location for you to access your own service providers from your own devices. We prefer guests bring their own towels, however guests may use the towel supply at the cottage provided they wash, tumble dry, fold and return the dry, clean towels back to the original cupboard. Small Electric Oven only Hotplates available. Some basic pantry items available - paper towel, cling wrap, alfoil, herbs & spices etc (all we ask is that it guests use the last of an item if they can replace it). 2 Adult Bicycles & Helmets available at your own risk. 1 x Girls (age 7) Bicycle & Helmet available but at your own risk. Helmets are a law requirement in WA. Bike Repair Shop 200 metres away. Some kids water sports gear available in shed, ie: boogie boards, fishing rods, etc. A fantastically located and equipped property, Maisie's Cottage is in the centre of Busselton and a short walk from the beach, jetty and town. The property is fantastically equipped with bikes, books, games and kitchen equipment - while you may have to be creative about your cooking and wash up after yourself, it's not a big deal. Absolutely great place, the two of us and our dog loved it and we'll definitely be back. Maisie's Cottage is delightful, an example of a bygone era which suited my husband, our small dog and myself as a peaceful break for a few days. It is clean, comfortable and well equipped to suit a couple, a family with or without children. I loved the homely atmosphere and imagine it was a happy, well kept home to a previous generation. It is well situated in a quiet neighbourhood and an easy walk to the town centre, the sea-front or local pet friendly café which sold delicious food. Communication between parties was prompt and friendly. We really enjoyed our stay. We all very much enjoyed our stay. It was great to be able to walk to the beach. Our dog also loved it and we even had an outdoor shower. Everything you could need and a very helpful owner. Nothing too much trouble for them -would stay again. Very clean and loved the front verandah. The bakery on the corner is worth a try too! Gorgeous cottage in a great location! Gorgeous cottage with good amenities, heating, clean comfy beds and everything you need for a weekend away. Fantastic location, close to beach and town and suitable for families. We will definitely be back!